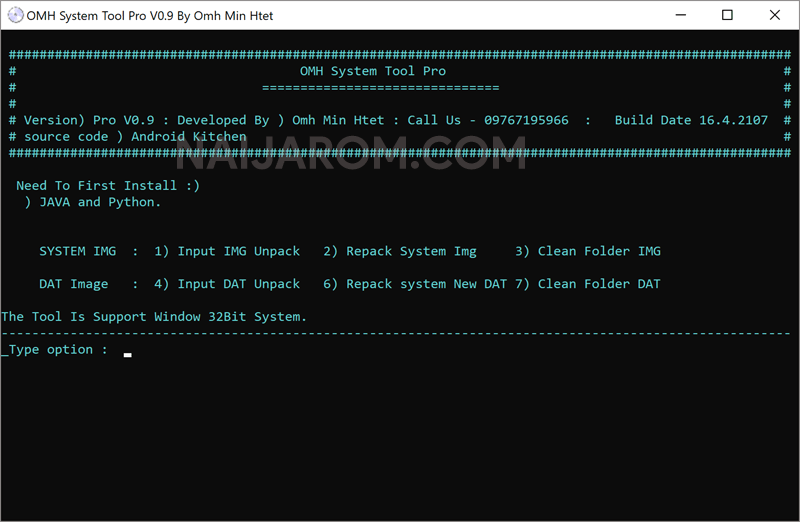 OMH System Tool Pro V0.9 is a small application for windows computer which allows you to unpack and repack the system.img file, unpack and repack the dat file. In order to use the tool properly, you need to install the ADB Driver, on your computer, then install the Java and Python on your Windows Computer. Once you are ready, launch the Tool and Select the Option i.e 1 to input the IMG file for unpacking, 2 to repack the system.img file, 3 to clean the folder image, 3 to input the dat image for unpacking, 6 to repack the system new dat file, 7 to clean the dat folder. The Tool will only run on Windows Computer having 32bit OS. It wont be able to run properly on the Windows computer having 64bit OS. [*] Compatible: The above software runs smoothly on Windows XP, Windows Vista, Windows 7, Windows 8, Windows 8.1 and Windows 10 (32 bit only). [*] Credits: OMH System Tool Pro V0.9 is created and distributed by OMH Min Htet (developer). So, full credits goes to OMH Min Htet (developer) for sharing the tool for free.